I dropped my food processor on a tile floor. The housing cracked but it still worked. The fact that it still worked may or may not be a result of some soldering that happened a couple of years back when I dropped it the first time. When I say worked, I mean whirred for a while and then quit but worked again in a few minutes. And it made some loud sounds. And smelled funny. Clearly, it was time for a new one. There are some things I am willing to spend a pretty penny on because they withstand the use (or abuse) I put them through. Kitchen stuff is one of those things, food processors included. 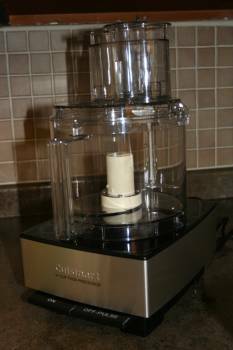 I checked America’s Test Kitchen reviews and found that I could justify needing a Cuisinart because they are so durable (insert clapping with glee here). I have always wanted one of those guys! And then I saw the price. I stopped clapping. I use my food processor fairly often but MAN they were a lot of money. I needed a different strategy so I got my thinking cap on and tried to think of a way I could get my dreamy appliance without having to sell a kidney. Somewhere in the recess of my brain I remembered that my credit card builds up points I can trade in for stuff. I seemed to recall they had some pretty fancy choices. I zipped to a computer and logged in to my card account and battled the website designed to thwart people trying to redeem their points and LOW AND BEHOLD they had them and I had enough points to get one! A couple of clicks and a UPS delivery and my lovely food processor is now on the kitchen counter, ready to whip up a batch of hummus. When you are in need (or in want) of something, don’t forget about your rewards programs! What rewards programs do you use? What have you gotten that you didn’t have to buy? Note from Christina: Susan had a great idea for saving on a big purchase! We pay for all of our gas and utility bills with a rewards credit card and pay the bill in full each month. By October, we’ve usually earned enough rewards points to put a major dent in the Christmas shopping. Just remember, this system does not make good financial sense if you’re not paying your bill in full each month.